French polishing - a variety of polishes can be used depending on the finish required. Shellac, the resin of the lac beetle, is used to provide a high quality traditional finish, which was used on most antique furniture. 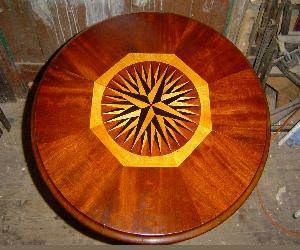 Tradtional French Polishing gives a depth of finish that other methods simply cannot achieve. Inlays, marquetry and parquetry is the application or repair of slices of woods or veneers that have been applied to give a geometric design (parquetry), organic shapes and designed (marquetry) and thin inlays (stringing). I use, where possible, veneers and woods of the same age to ensure the best possible match. Veneers are cross-cuts of woods that are glued and pressed onto a wooden base. Sometimes these can lift, dry out, or crack and need either re-glueing or replacing. I use period veneers for all repairs. Wood turning - spindles on chairs, legs, feet and handles can all be replaced by turning matched woods to give a seamless repair to all types of furniture. For example, using the remaining leg, I turn an exact copy which is then stained and polished to match.